Last Saturday, La Crosse Area Showing Up for Racial Justice (SURJ)—a group of anti-racist white people and people of color who are willing to work with us to hold us accountable—held a small community discussion to talk about symbols of white supremacy in La Crosse. This gathering was prompted by a nationwide call to address white supremacy in locally-appropriate ways in the wake of overt white supremacist violence in Charlottesville, Virginia. This was called for by the Movement for Black Lives—a broad coalition of progressive people of color working to dismantle oppressive systems and build a world where we are all free. SURJ supports the Movement for Black Lives. 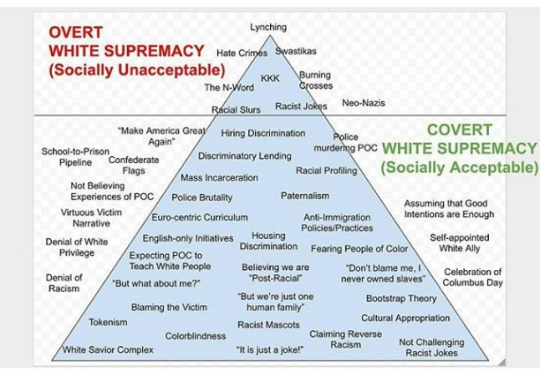 Many of these may seem easy to overlook for white people especially, but they provide the background noise of institutional racism and various levels of white supremacy. While we can see the problematic nature of these racist symbols across our community, it is not up to us as white people to decide on our own what to do with these observations, particularly those that attempt to represent (and often misrepresent) people of color in the community. People of color have a breadth of perspectives on these symbols and problems in La Crosse and how to best respond to them. SURJ seeks to follow leadership from local people of color and will take action in collaboration with those groups. 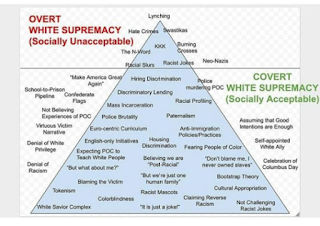 It is important that we work to keep bringing these things to consciousness by having conversations about how white supremacy functions in our community. As white people, we do have access to power and privilege that people of color do not have. We are all in different positions to challenge these symbols in our community. We can and should use our privilege and the relationships we have to help our neighborhoods, local businesses, and city evolve. Together, we can grow as a community. After our discussion on Saturday, one man offered to stop by Murphy’s Frame and Axle, the auto repair shop where a Confederate flag was recently seen hanging above a work station. He spoke with the owner and let him know that some people were talking about the display of the Confederate flag in the shop and were concerned about it. The owner agreed that it was a problem and told him that he was already going to have his employee take it down. This is an example of using white (and male) privilege and a friendly, direct approach to take steps towards making our community safer and more inclusive. While the Confederate flag and other racist symbols are not acceptable and should be identified as such, we must remember that some if not many of the people displaying or allowing them may not understand the context or impact of their actions. Approaching people in a non-combative way and starting a dialogue can lead to growth for our community and a coming together of people, instead of provoking more conflict from the start. We have to withdraw our support from white supremacy, in all its manifestations, and we are in a better position to do that when we call people in to join us before we start calling them out and alienating them. This is how we can expand our network of friends working together for a better world. If you have any relationship with someone displaying white supremacist symbols, please drop in and just have a conversation about it. What do the symbols mean to them? What do they mean to you? Do they know that people are concerned about it? How does it make you feel to see these symbols in our community? It is not helpful to confront people hostilely. We need to start an honest dialogue about what those symbols mean to us. Consider: Where do you hang out? Where do you shop? Where do you work? What friends or neighbors could you approach about this? Do you know who your city council alderman is? Have you talked to them about your stance on these issues? What conversations have you started in the community? Please share, so we can all keep growing and learning together.